The capital city of Poland and a prime dark-tourism destination. This is mainly due to the fate the city suffered in WWII at the hands of the Nazis, with inhumane Ghetto living conditions and deportations during the Holocaust, Gestapo terror, brutally crushed uprisings and large-scale destruction of almost all the old buildings. And then this was followed by the communist era's repression and privation. Visiting all of the city's dark sites can be a tough experience, but Warsaw also has many pleasures to offer – despite the city's reputation. Warsaw is generally much underrated as a city break destination, and it's certainly less touristy than Krakow or Gdansk. But personally I find it a really cool place! More background info: Poland's capital is a city that ranks especially high in dark-tourism terms. This is largely due to the fact that few cities suffered such a battering during WWII as Warsaw did. First came the onslaught and bombardments by Nazi Germany as Poland became the first country to be attacked and conquered in the war. Then followed a brutal regime of persecution and murder, targeted in particular at the city's Jewish population, as usual. First they were imprisoned in a cramped ghetto, then deported to the death camps (mostly Treblinka). However, Warsaw didn't just suffer passively – two uprisings, though ultimately unsuccessful, stand out in the annals of this grim period: first the Ghetto uprising of 1943, and then the 1944 general uprising, after which the Nazis levelled most of what was left of Warsaw in retaliation – while the Soviet Red Army looked on and did nothing. Don't get the two events confused – some do – as they were quite distinct, not just chronologically speaking. Also, the 1944 uprising plays a major role in Poland's national(istic) self-portrayal and understanding, as is evidenced in particular in the ultra-modern Uprising Museum. In contrast the Ghetto uprising has long been commemorated through an old-fashioned monument from 1948 – see under Ghetto Trail. Right opposite this monument the new Museum of the History of Polish Jews (POLIN) opened in 2013, which includes a section about the Holocaust as well, and is now the core element of commemoration of those dark times, as well as a celebration of the history and recent rebirth of Jewish life in Warsaw and Poland. Following WWII a massive reconstruction effort was undertaken to rebuild war-torn Warsaw, but as this took place in the context of the communist era of Soviet dominance only a small part of the actual old architecture was recreated, otherwise it was Stalinist intimidation architecture, as in the massive "Palace of Culture and Science", or else drab prefab high-rise housing blocks. And as if to add insult to injury at the end of the communist era, Warsaw only played second fiddle in the process in which the Solidarnosc movement started to put an end to that era, with Gdansk and Krakow taking the lion's share of the credit for overthrowing communist rule. Still, Warsaw today has to be regarded also as the dark-tourism capital of Poland, especially as far as internal tourism is concerned (the Uprising Museum in particular draws large numbers of Polish visitors). But it's also become increasingly attractive to foreign tourists. In addition there's some splendid post-war socialist architecture to behold, and I don't mean the drab concrete blocks of flats built hastily over the rubble to provide housing for the homeless populace after the war. 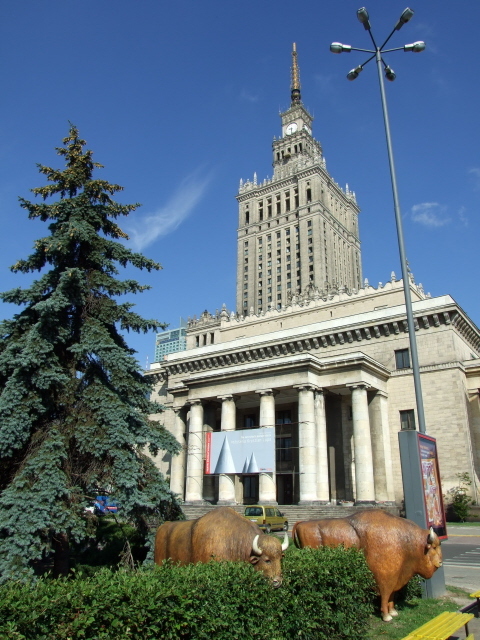 No, there's also the grand show-off kind of Stalinist architecture, in particular what must be Warsaw's No.1 landmark, the Palac Kultury i Nauki. 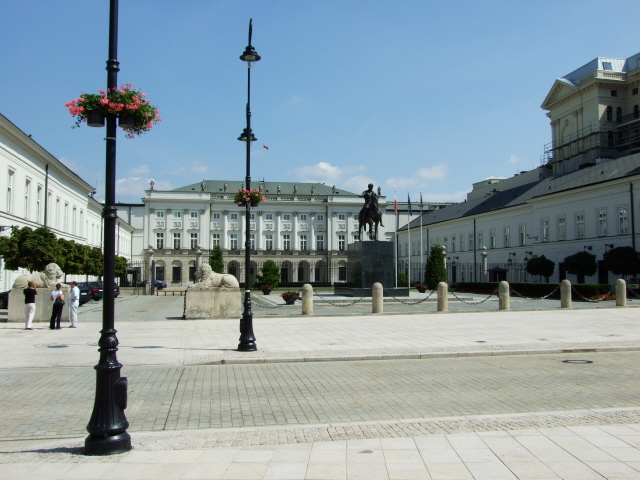 but also the grand boulevard of Marszalkowska, which takes you past some marvellous examples of socialist realist sculptures of workers of various descriptions adorning the grand facades. A less impressive but still rather imposing building is to be found at the junction of al. Jerozolimskie and Nowy Swiat: this used to be the Polish Communist Party's headquarters (and is now a banking centre). A short walk east there's the Army Museum, whose exhibits include the 'Kubus', a kind of home-made tank, an armoured vehicle built by the Home Army and used in the Warsaw Uprising. At the other, northern end of central Warsaw, beyond the restored Old Town, is the massive 19th century Citadel. This features a few things of interest to the dark tourist too, notably the remnants of the former prison (called Pavilion X), as well as the Gate of Executions. The newest significant addition to the complex is the Katyn Museum. En route between the latter and the Old Town a short detour south-west on Konwiktorska boulevard takes you to the dramatic Monument to the Fallen and Murdered in the East, which generally commemorates the victims of the Soviet invasion and repression in 1939 in the east of Poland (see also Molotov-Ribbentrop-Pact). It was unveiled in 1995. Bang in the middle of tourist Warsaw on Krakowskie Przedmiescie is the Palac Namiestnikowski – it was here that the treaty was signed that gave the Warsaw Pact its (first) name. It was also the site of the 'Round Table' talks of 1989 between the government and Solidarnosc, which was a major element in the process that ended communist rule. The Palace later became Lech Walesa's presidential residence. 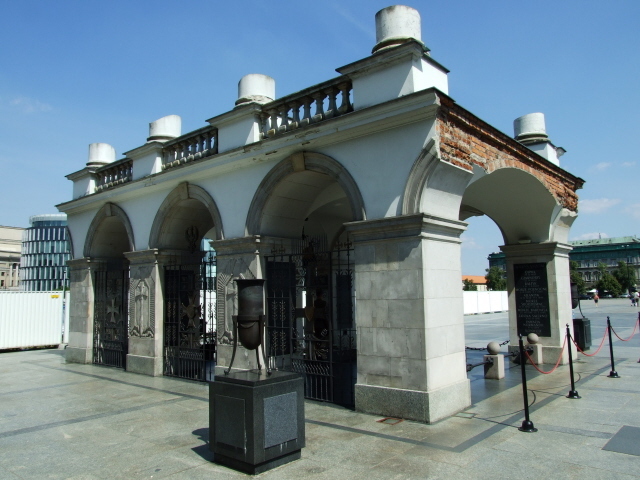 And finally, not far from the Presidential Palace, on the western end of Plac Pilsudskiego is the tomb of the unknown soldier with its eternal flame guarded by two soldiers. What's more remarkable than its current function is perhaps the fact that the arches over the flame/tomb are the only surviving traces of the former royal palace which the Nazis blew up in 1944. The square in front was used by protesters against the communist regime in the early 1980s – until martial law prevented this (temporarily at least). Today it's a rather drab traffic-free and featureless concrete expanse, whereas behind the tomb of the unknown soldier lies a pleasant park. If you fancy a bit of tongue-in-cheek post-communist nostalgia in one of those commie-themed bars/restaurants, then Warsaw's Oberza Pod Czerwonym Wieprzem (The Inn Under the Red Hog) is one of the better specimens of the genre. Location: in the centre of Poland, roughly on a straight west-to-east line between Berlin and Moscow. Access and costs: easy to get to; but not cheap. Details: Warsaw, as the capital city, is also Poland's transport hub, so there are excellent connections, by air, road or railway. The “Frederic Chopin” international airport is not only the central base for the national carrier LOT but is also served by a host of other airlines. From the European mainland, however, trains are well worth considering as an alternative (e.g. the direct connections from Berlin or Vienna); when booked early these are extremely good value. Those who want to go by car can reach the city quite comfortably from the west via Posnan on the motorway A2 (E30), which currently ends at Warsaw. Further on, especially further east, roads aren't as good but not too bad either. But whether you really want to drive in inner Warsaw's hectic traffic on multi-lane boulevards is something to be considered with care ... and weigh up any potential benefits against the risks and stress it would entail … Personally, I would much rather make do with getting around by public transport. The bus and tram network is functional enough. There's a metro too, of just one single line ... but that's at best of marginal use to tourists. Warsaw offers the widest choice in accommodation at the full range of price levels, to suit all pockets. If you shop around in advance, some really good deals can still be found, even at upmarket hotels. With regard to food an drink, the range of cuisines has broadened over the years, and while Polish staples still dominate, you can now also find plenty of good alternatives at various ethnic restaurants. With regard to drink it has to be said that Warsaw has become a Mecca for the craft beer movement. Several specialist bars/restaurants have sprung up in recent years so the discerning beer drinker is as spoiled for top-quality choice as one would be in, say, California (where the movement began and is still strongest) – and that at a fraction of the prices you'd have to pay in the US or Western Europe. For those who'd rather stick with wine: did you know that Poland even produces some wine itself? And it's of pretty decent quality too (mostly in the style of German wine, especially that of the Saale-Unstrut region which borders south-western Poland.) It's available from a few speciality shops and in upmarket restaurants in Warsaw too now. Time required: You should allow at least five to six full days, and that's just for the dark sights of Warsaw; add more time for taking in the other attractions of this city as well. Combinations with other dark destinations: The nearest other dark site to Warsaw, though a bit tricky to reach, is Palmiry, the site of Nazi mass executions and graves, now a national memorial. Warsaw also makes a good jumping-off base for exploring either the south-east of Poland (Krakow, Auschwitz, Lublin with Majdanek, Belzec and Sobibor) or the north (Treblinka, Wolfschanze near Gierloz, the Rapa pyramid, Suwalki, Gdansk). Treblinka could also be visited on a day trip from Warsaw (best by car). Combinations with non-dark destinations: Warsaw has a lot to offer on this front too, not least its reconstructed Old Town, where it gets really touristy indeed, complete with rip-off prices at restaurants. Just a bit to the north of the Old Town, the district called Nowe Miasto is a wonderful oasis: an equally picturesque quarter, but a lot less crowded and not (yet) so commercialized. More recently up-and-coming areas include the blocks east of the “Centrum” train station, and now also the old Praga district across the river (it's sort of shabby-chic and an artsy-crafty scene). Warsaw also has a number of pleasant parks, museums, wide boulevards, glitzy shopping centres and some fantastic restaurants. The city may not have the pretty and quaint feel e.g. as Krakow does, but it's still a worthwhile travel destination in its own right. Otherwise, Warsaw is a natural starting-off point for exploring the rest of Poland, especially to the east and north (Masuria).